I have carbines. Red dots. Variables. All nice things. I also have this old ditty called an A2 rifle. You might recognize it as an M16A2 clone. Modern carbines are good and all, but sometimes you may want to take an old rig out and ride it hard. After all, it’s still a 5.56. In this case, I wanted to update my A2 for no other reason than it is there, and no rifle shall go neglected in this home. So if we are going to update a classic, how to we keep it “classic” yet add some utility? I will show you the way. US Marine Corps (USMC) members from L Company, 3rd Battalion, 3rd Marine Regiment, 3rd Marine Division, perform a biathlon on the Camp Hansen ranges, firing a Colt 5.56mm M16A2 Assault Rifle. Lt. Col. David M Lutz was the program manager for the M16A1 product improvement program. 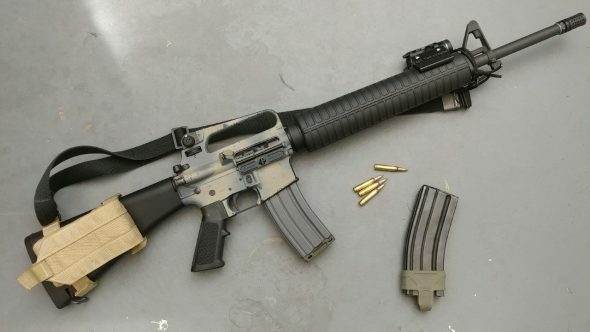 There were many changes to the M16A1 and many shooters don’t fully understand the reasoning behind many of these updates. The various aspects of the rifle are discussed in detail here: Link to AR15.com with Lt. Col. David Lutz as poster ColdBlue. I can’t say enough how appreciative I am to him and others like him for posting these accounts for us! The stock A2 sights are perfect for KD ranges. Having the ability to adjust elevation on the fly to match a known distance target is largely an unrealized feature for a fighting rifle. The problem is… that field targets present at unknown ranges with 100% certainty. (uncertainty?) In these scenarios, the drum is largely of no benefit. The idea of ranging a target out to 600 yards with the naked eye is also ludicrous. If such a mad-max era shot needs to be taken, grab the optic equipped rifle. So what do we do with those sights? I replaced my stock sight with a national match 1/2 x 1/2 rear. Having the ability to practice marksmanship concepts at KD ranges is still appealing, but outside of KD ranges it doesn’t have much utility. So my main upgrade to the drum assembly is a simple adjustment to the drum: the Improved Battle Sight Zero. This will allow you to rotate the drum below the 300 meter zero to obtain a more useful 50/225 yard/meter zero. The second update to the rear sight would be a BlackHawk! same plane rear aperture. Perfect, flat black aperture. No glint. Great sight picture from the BlackHawk! same plane rear aperture. This aperture is quite unique. It maintains the same zero from the large and small aperture. The astute will notice tha the witness mark is on the small aperture instead of the large. The witness mark is made to allow a quick visual guide to the rear sights position on the windage index marks. Since it is on the wrong side, we need to flip the rear sight around. This causes the FLAT side of the small peep to present to the shooter. This actually has a huge benefit. All glint from the environment is eliminated. Either the peep sight is fully illuminated or is fully shaded. The standard USGI peep has a cup milled into the small aperture, and this causes light to reflect off the curved surface. This glint detracts from the sight picture. The flat BlackHawk! (cue swat jumping from explosions) aperture is vastly improved. This isn’t the first time that companies have noticed the glint. Armalight’s discontinued Infantry Classic AR15A2 shipped with a modified FLAT aperture noting the same benefits. See the review here. Near the bottom of the article is a photo of Armalight’s flat aperture. This peep is pretty flat black, but you can still see the light gradient from the top down to the bottom. Some factory peeps are too shiny and have a far brighter glint than this specimen. So with the Blackhawk! (yup explosions) system, we keep the large and small aperture, have a superior sight picture on the small peep, and get to keep the same zero between apertures. Bingo. A perfect upgrade to the AR15A2. The next sight upgrade is nail polish. The drum is the perfect place to store your zero data on multiple loads. With some paint, we can obtain a zero for our primary load using the front sight post and then zero in other loads with the intent of making zero adjustments to the drum and windage knob only. In doing so, we can rotate between loadings and keep our rifle SHTF ready. In my example, I have two loads marked: XM855 in green and M193 in white. In this case, both markings denote a 50 yard zero. Lucky me, both share the same windage settings. Once I add and mark my bulk 75 grain handload on the next range trip, I will have three full zeros baked into the rifle itself. Nail polish and a drum rear are good friends. Zero and mark multiple loads after primary load is zero’ed. No data book needed for a basic 50 yard zero on multiple loads. The final update is to the front sight post. I have equipped the XS Sights tritium illuminated front sight post. I have heard many veterans ridicule iron sights as less reliable than modern optics… primarily due to the thin A2 front sight post breaking or bending. I can believe it. If you make it past the ears, an impact would land full force on a tiny machined nub. The XS laughs in overbuilt-thickness. It’s wide. It’s long. It’s got good contrast, and allows you to track the front sight in low light. Align with target. Power on the light and obtain positive I.D. The XS turns jet black behind the bright weapon light for a solid sight picture. Fire. In use, I did not find the extra width distracting. It’s fast on target and it’s still precise. So with those upgrades I believe we have the trinity of good irons. We have a more user-friendly rear sight with improved sight picture, better contrast in dark, no light, low light, from the front sight… and we have a variety of loads zero’d mechanically on the drum. WIN. WIN. WIN. Reliable, versatile, and more practical than the original M16A2. Plus I can still dial dope if I want to. Let’s keep this one simple. I upgraded my A2 with a MBT trigger. It’s simple, durable, and enhances the feel of the trigger. With a crisper, lower weight trigger, I can shoot more accurately and I can string together shots with less delay. It’s a great trigger. It’s $87 dollars until Xmas. Nuff Said. Faster ROF, more accurate shooting, better feeling… Larue MBT. My second control upgrade is a hybrid compensator. The common as dirt A2 compensator does a fair job. It certainly does a better job than the bare muzzle. Lt. Col. Lutz designed the A2 comp to be timed to the shooters preference to mitigate muzzle drift. I have never tried that technique, but I have tried a variety of muzzle devices on the end of a 20. The Cav comp is a great choice for a pure muzzle climb mitigation, but the Griffin Armament M4SD compensator is thus far my favorite. It retains the closed bottom of the A2 for dust signature mitigation, reduces recoil, and has very little side concussion. There are more effective brakes, but I want a bayonet for Christmas and that’s my dream. Ergo the M4SD retains the shape of the A2 and allows me to plug-in that sweet bayonet for… um… Reasons. I have reasons. The M4SD makes a smooth shooting gun a bit softer, and doesn’t blow out the ears. Plus stabby stab still fits. Nice. Yes, the A2 can be modular. Ish. Sort of. Anyone can grab a set of Magpul Handguards with M-Lok and call it done. Not me. I found them to be fantastic quality, but heavier than USGI handguards. Add a permanent light and our beloved A2 feels a bit more porky than we want. Having a modular mounting system which allows me to add and remove light on the fly is what I ended up choosing over the MagPul kit. The Kerm Lock needed to exist in 2001. For people who want a light mount on classic hand-guards here is your Huckleberry. Yes, my nylon web is now a two point courtesy of the Top Sling Adapter and 550 cord. The Kerm Lock system is faster to remove and replace than any M-Lok system, and it feels solid. Having a light handy and then removing it for storage or KD range use is awesome. Instantly remove a few OZ from the front of the rifle and replace when necessary. The A2 stock is too loooooooong! Hear the cries of a million civilians with small arms! (HEH HEH) Hear the cries of soldiers in body armor! Who’s responsible for this? Actually, the Army requested a longer stock and Lt. Col. Lutz accommodated. Yes, these days it feels a little long, so ditch it for a Cav Manufacturing A1. Not only is it a more comfortable length, it has a massive storage compartment and accepts USGI trap door assembly. I have oil, a spare bolt, and many small repair components to keep this rifle running. Forever. Can your 12 inch carbine punch through quarter-inch thick steel at 100? I don’t know about your AO, but if MAD-MAX starts in my area I am gonna need to shoot through up-armored bro-dozers on a regular basis. Save me green tip! 2X ACOGs are made for the carry handle. I had one and loved it, except for the reticle. I am awaiting a time when I can obtain another 2x ACOG with a Crosshair reticle. I have my reasons. With the flat trajectory out of a 20, you need to aim at the chest from 0-300 yards, and if you think they are past that aim at the hat and you will drop rounds back to the chest. It’s practically a rail gun. Keep in mind that even though superior loads have been developed which enhance the terminal performance of carbines, there is still no replacement for displacement. Superior loads in the carbine become flatter shooting, and harder hitting in a 20. Coupling the flat shooting nature of a 20 with a simple optic and a good maximum point-blank zero will get you as close as possible to a point and click interface as is available in 5.56. It’s a great rifle for outdoors. A2 Rifles are exactly what they are. Use the platforms advantages but don’t fool yourself into making them into something they are not. The A2 has some major advantages as a backup and or Mad Max rifle. There is nothing to fall off or come unscrewed. With a few upgrades, you can gradually improve the rifle without forcing it to be something it’s not. I look at my A2 as old faithful. It has a certain safety to it. It goes bang every time. It’s setup for multiple loads, so that no matter what I have on hand I am going to hit where I aim. If it breaks a small part in the field or competition, a few minutes later I can have it up and running again. It shoots flat and hits hard. If an optic fails, the irons are as good as irons have ever been on a fighting rifle. Me and M16A2 style rifles go way back. I have added rails, optics, and everything else over the years. My favorite configuration of the M16A2 thus far is quite vanilla. A classic and smooth shooting rifle doesn’t need much to make it that much sweeter. As a field rifle, or a camping gun, or a build for your Mad Max SHTFantasy… you can’t go wrong with a sleeper M16A2. If you master your rifle, from any era, you are head and shoulders above 95% of your armed countrymen… sadly. Sit me a veteran who still shoots his M16A1 weekly over the collector with the block II clone which sits idly by in the safe. Thanks for reading and I hope you have been able to pick up some tips from the article. I will be shooting the above rifle as well as a few other pieces of kit at a private competition Nov 3rd. It’s been a while since I killed cardboard under the pressure of a timer. Let’s hope the A2 and my humble G19 make a few people feel bad! Lothaen, Like the enhancements you made to the Classic A2. Can explain in a little more detail how you have managed to configure 2 different sight zeroes (M855 and M193) with the IBZ zero in play? See if I understood it right. The M855 (Primary) is tuned with Front Sight only adjustment. Static on rear sight drum adjustment elevation for the M855. M193 (Secondary) is zeroed with rear sight drum. Static on front sight adjustment for the M193 using whatever elevation adjustment was made with M855 as the static value setting. Hard to tell in the picture but it looks like you are 2 up from bottomed out for green marked M855 and M193 is 4 up from a bottomed out rear sight. 6 o’clock hold at 100 yards. Remember that I noted that I have a national match rear sight. This drum is able to be set at “0” for zero clicks and can be bottomed out this way. I obtained a rough zero with green tip first via standard front sight adjustment. The Achilles heel of the XS sight is that it needs a full 5 MOA of adjustment per rotation so I knew I had to rely on some wiggle room with the drum assembly. I got a rough zero and adjusted the wheel until I obtained a 50 yard zero with green tip and marked the drum. I then zeroed m193 at 50 only adjusting the drum. There is 1 MOA difference in elevation between the two. I knew if I tried to zero them both at 100 I might not find success since I would have no wiggle room to adjust below the 0 mark on my drum for other loads and thus choosing the 50 yard zero gave me some elevation dialed in so other loads could also zero below the green tip marking. So if you had a battle sight zero and could rotate your drum (A2) minus 2 clicks for 2 MOA of adjustment, hopefully your secondary zero would land at max 2 minutes below your 8/3 setting. For a detachable carry handle the IBZ would allow minus 4 clicks but its still 2 moa, just finer adjustments. I hope my methodology is clear, but your explanation is indeed how I sighted in. On my old 20″ A2 I did something similar, but instead of different cartridges, I accommodated different zeros. First I separated the two parts of the elevation drum by using a 1/16″ allen wrench through the witness hole forward of the rear site to loosen the screw holding the drum parts together. This allowed me to rotate the top of the elevation drum (the part with the numbers) counter-clockwise three clicks while holding the bottom of the wheel in place. Then I tightened the allen screw back to clinch the two parts of the drum together again. This creates three clicks lower than the 8/3 setting (which previously sat at the bottom). Two clicks lower than 8/3 now yields a 200 setting. And a three clicks lower than 8/3 is now the 100 yard zero setting. Today I used the 200 zero setting, but can easily move it if needed. I also used white Testor model paint (enamel, slightly thinned) to fill in the numbers on the drum and the windage scale on the back, together with the alignment mark on the 0-2 sight. It makes it easy to read. Thinning it lets it run into the grooves. Let it dry then gently rub off with gun solvent. It will come off clean as a whistle. Looks awesome and easy to read. I do love me some 20″ rifle. I know the 16″ is ubiquitous these days, and everyone accepts them as “the standard.” But my 20″ is still my favorite shooter and, as you said, the one that will probably last the longest. I know you’ve mentioned that rear sight aperture before. I kept going back and forth between that one or the CSAT sight with a notch cut it in it for very close range, more like a pistol sight. I have thr CSAT rear and I cant quite get used to it as much though its a nicely made component. Love the rifle length guns for sure and pleased that Lothaen is doing his level best to keep them relevant in the micro mini AR age. Next on the wish list is an FN A4. I missed out on Shark Arms FN uppers back in August, SNAP!! Busy acquiring/building the enhanced A2 build at the time. By my math, the standard post should match shoulder-width at 150yds. A 0.052″ at 200yds, and 0.035″ at 300yds. Does anyone make a barleycorn for ARs? KNS’ narrower posts are stronger than most NM due to using standard width til the top, but shares the A2’s weakness. Just to toss in my own personal two cents – My first AR was a C7A1 clone. I love that rifle, and it has close to 3,000 rounds on it without a stoppage, now. I’ve since added most of the enhancements of the C7A2, and an improved trigger (using an ALG ACT trigger in it, now. I think that a lot of them are excellent improvements to an already amazing rifle. Because I started with a flat top, I never had to worry about the rear sights, but one of my favorite non-clone correct upgrades was one of those tritium front sight posts. I also added a folding verticle foregrip like the C7A2 that I’ve cut short to act more like a more modern stubby grip. When I get around to it, I’ll certainly be sure to post pictures of it. Lothaen, what scope mount(s) do you favor? I’m just trashing one I bought because it wobbled, and no amount of tightening the screw would secure it properly to the carry handle. I’ve ordered a Leupold mount, as it had a recommendation. Your thoughts would be appreciated (as would everyone else’s thoughts).